For the first time ever, scientists have observed a polar bear catching and eating white-beaked dolphins. It’s suspected that the dolphins ventured too far north and became stranded in the ice — a possible consequence of climate change. The observation was made by Jon Aars and his colleagues from the Norwegian Polar Institute on April 23, 2014, on a small fjord in Svalbard, Norway. “This is the first record of [white-beaked dolphins (Lagenorhynchus albirostris)] as polar bear prey,” write the authors in their study, which now appears at the science journal Polar Research. “White-beaked dolphins are frequent visitors to Svalbard waters in summer, but have not previously been reported this far north in early spring. We suggest they were trapped in the ice after strong northerly winds the days before, and possibly killed when forced to surface for air at a small opening in the ice,” they write. The bear managed to catch not one but two dolphins, and it probably did so in a manner similar to they way they capture seals. These animals are opportunistic predators, and they rarely pass down an opportunity for a meal. By the time the researchers arrived, one dolphin had already been consumed, while the second was being deliberately covered in snow — a possible sign that the bear was preserving it for a later meal. But this wasn’t the only incident documented by the researchers. 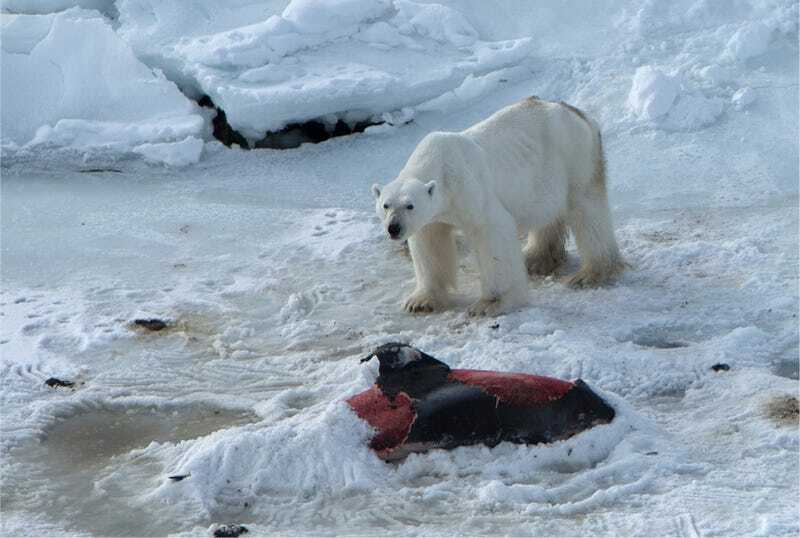 The team says that at least six different polar bears were seen scavenging on the carcasses.